Made from the wood of the Century Tree, the centennial bench is located in front of Webster Hall. Next time you find yourself in front of Webster Hall, have a seat on the newly installed centennial bench located in front of the centennial flag pole. The bench is made from the wood of the Century Tree, the 100-year old tulip poplar which once stood in the courtyard between Webster Hall and Loretto Hall. The bench was commissioned last year for the centennial celebrations. 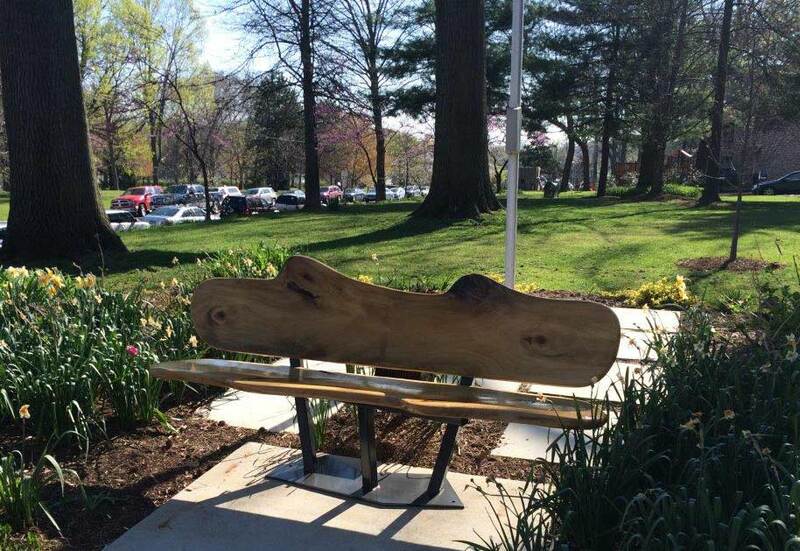 Edwin Akers, a local artist from Webster Groves, designed and hand-crafted the bench pieces. The bench is located by the centennial flag and the New Century Tree, a tulip tree planted for the centennial and named in honor of Centennial Planning Committee chair Elizabeth Robb. Take a break and sit a spell under the centennial flag, honoring 100 years of the University's history. Read about the accomplishments and contributions to Webster during the centennial celebrations here.